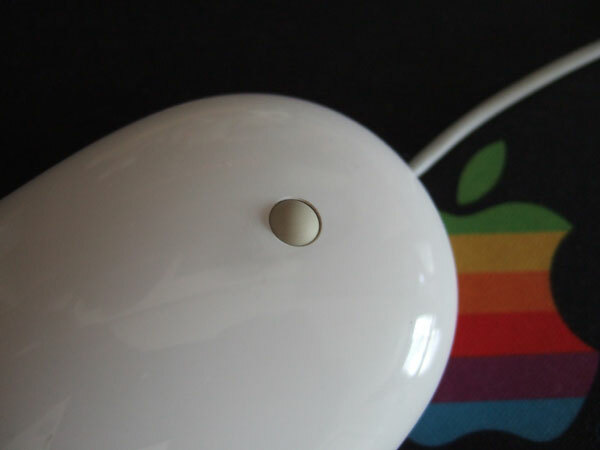 Apple Mighty Mouse is really useful, fine and cool device but that has a fatal defect.... probably you know well, scroll ball will get not to be worked due to accumulation of dust. APPLE introduced troubleshooting on their website. 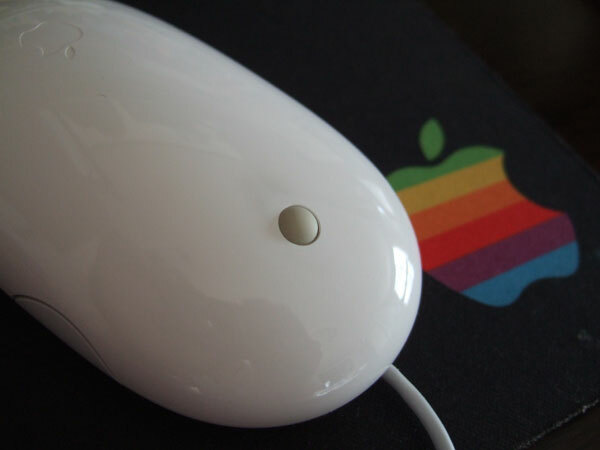 However it didn't work for my Mighty Mouse, also I've hardly heard of reputation that is effective for fixing the problem. Many people dismantled Mighty Mouse to solve this problem, however it's difficult to accept for me because dismantling will spoil the beauty of Apple product. 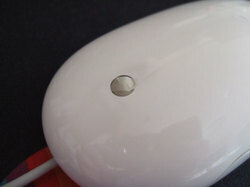 So, I would like to introduce the way to repair Apple Mighty Mouse without dismantling. 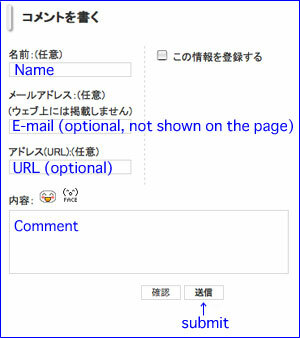 I am confident this method will be helpful for all Mighty Mouse users around the globe who are in trouble with scroll trouble because many Japanese Mac users supported it by successful comments after introducing this on the Internet 1year ago. Please try this way if you are in trouble with dust problem of Mighty Mouse. *** DISCLAIMER *** Please try this method by your responsibility. 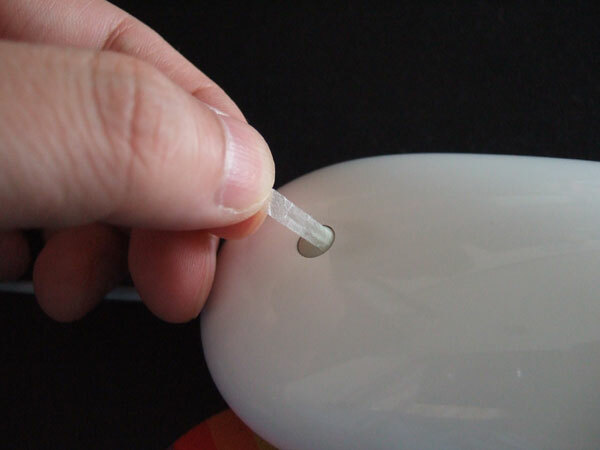 Double-stick tape is only material that you need to prepare for this maintenance method. Since flexible material is better than hard one, paper based tape was used in case of this. 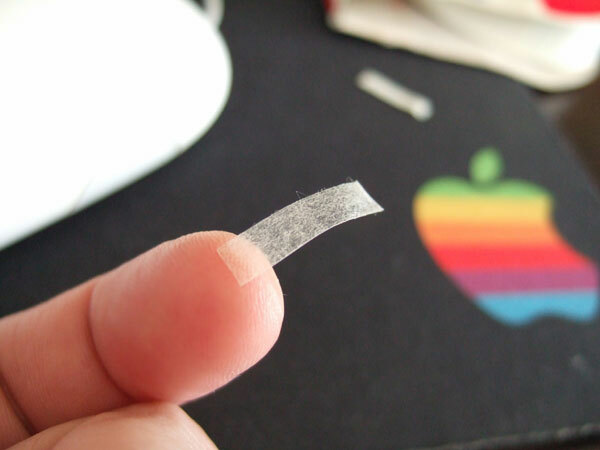 Tape were cut with approx. 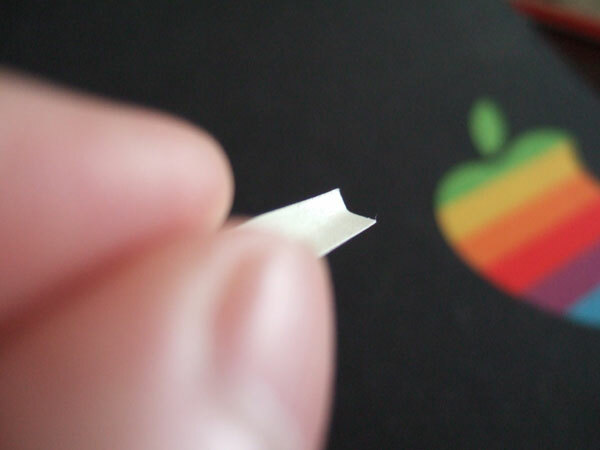 2cm (1inch) length in this photo. 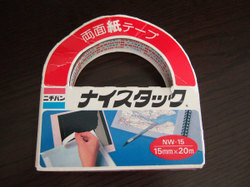 however, I recommend you to cut 4-5cm (1.5-2inch) if you didn't get used to this way. Cut double-stick tape again with 3-4mm widths like small strips. Bend small strip softly and transform a little steep shape. 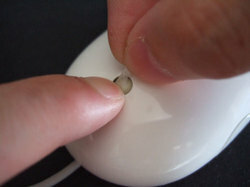 Insert small strip into the gap between mouse shell and scroll ball. Please don't forget this feeling while pushing down scroll ball and inserting small strip. Then remove the strip after confirming this situation. 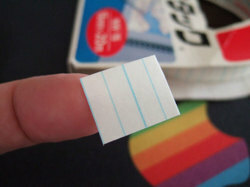 Peel back-paper of the tape. 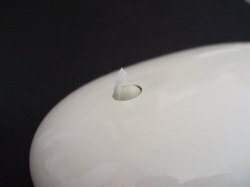 Be careful, you should not touch surface of tape in order to prevent from deterioration of viscosity. Stick end of the tape on surface of scroll ball and rotate scroll ball little by little. 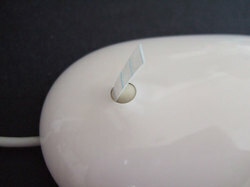 Send tape strip into inside of the Mighty Mouse. Keep tension when you rotate scroll ball in order to prevent curling up the tape. Keep flat the tape and wrap up scroll ball with double face tape. 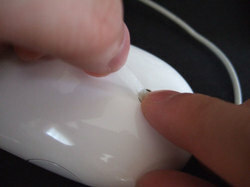 Keep pushing down scroll ball with your nail. Don't rotate scroll ball when scroll ball is staying original position. Replace new strip if tape curled, and try it again with new tape. 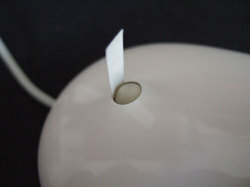 Remove oil and dust from surface of scroll ball before maintenance in order to make easy to stick the tape on scroll ball. Rotate scroll ball little by little and make sure to be like left photo. 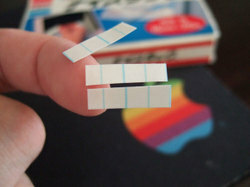 You don't need to mind if you get small wrinkle with the tape. Keep pushing down and rotate scroll ball softly up and down, right and left. 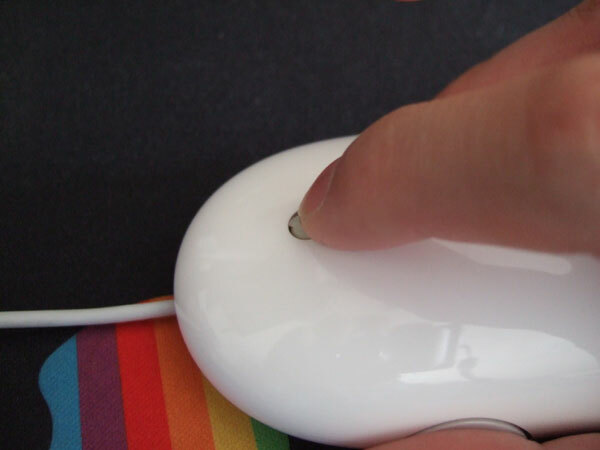 You should move your finger like short vibration on scroll ball. Please repeat short scroll action some times then remove the tape strip. Please repeat again above maintenance if your Mighty Mouse could not recover scroll function or if you feel rough feeling with scroll ball. 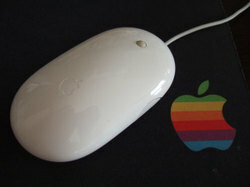 I tried to throw away my Mighty Mouse... again and again... when I got scroll trouble. However I was released from annoyance after I found this cleaning method. ↓ Your feedback would be appreciated. Thank you!